This facial forms the foundation for all our skincare services, which are always customized for your personal needs. You will enjoy a very thorough double cleansing polish and enzyme treatment. The Signature Deep-Cleansing Facial includes a facial massage and customized mask treatment to enhance the result of this treatment. Relax while your hands and arms are massaged during your mask treatment. The result will be fresh, new radiant skin. “A customized facial just for men “ This facial will target most skin concerns for men . This includes a full signature facial addressing those ingrown hairs , irritation from shaving and blackhead extraction. The facial ends incredibly relaxing with a facial massage including face , neck and shoulders. A Signature deep cleansing facial including L-ascorbic acid ( Vitamin C ) a highly-effective antioxidant peel that delivers immediate results. This peel will help to smooth the skin as it stimulates collagen production and promotes elasticity. Your radiant new skin will have a beautiful glow from this amazing Vitamin C treatment. This is a deep-penetrating facial treatment that will restore a youthful look by minimizing the visible signs of aging. This facial includes a Retinol Peel for a smoother, more youthful appearance. A customized mask and a veil of moisture with eye creme will leave your skin looking refreshed and feeling restored. • Hyaluronic to promote healthy hydrated-looking skin. • Stem Cells and Peptides to firm and restore the skin . • Recommended for normal to dry or sensitive skin types. A vitamin-infused blast of 95 % pure medical-grade oxygen with one or more high potency Bio Swiss organic serums. 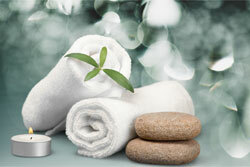 This is a full-service facial which includes the Ultrasonic deep-cleansing treatment. This facial provides instant results using the highest quality combination of oxygen, vitamins, minerals, peptides and amino acids. The Oxygen Facial is both ultra-therapeutic and luxurious. Your skin will feel fresher, more hydrated and radiant. Skin Health For Life™ is our philosophy of not just improving your appearance, but actually restoring youthful, healthy skin. Skin health is a lifestyle, requiring monthly maintenance and the right treatment for every skin type. The HydraFacial™ is not just a quick fix-it procedure – it actually improves the quality of your skin, helping to make it healthy. This is why the HydraFacial™ is so important – not only does it remove surface damage such as dead skin cells and impurities, but it also replenishes the skin with antioxidants using Vortex-Fusion®, the most advanced application of nutrients to the skin. This elite session includes the 4 step process w- LED light therapy and a dermabuilder vial. This additional ampoule is applied to the skin with the vortex step infusing a blend of hyaluronic , peptides and nutrients to plump your skin and leave it glowing. One of the most popular cosmetic brightening and resurfacing skincare treatments, this service is a non-invasive procedure with no chemicals or downtime. Diamond Microdermabrasion is appropriate for most skin types, because it can effectively reduce wrinkles, acne, age spots, stretch marks, and more. This procedure will leave your skin noticeably younger, feeling very fresh and new. This amazing facial includes the resurfacing procedure with Diamond Microdermabrasion. Imperfections are removed by a gentle and effective resurfacing of the skin, resulting in enhanced color, texture, and tone. This luxurious treatment is then combined with high-end technology, utilizing 24K Gold to soften layers of the skin. This super-hydrating treatment will lift and firm your skin, reducing the appearance of sun damage and lines. The Diamonds and 24K Gold Facial will exceed your expectations and provide you with the ultimate specialized facial treatment! This prestigious facial treatment combines microdermabrasion with ultrasonic and LED light technology to achieve a very thorough transformation of the skin . A Vitamin C Peel is also included for the red carpet treatment of all facials. Relax during your aromatherapy facial massage ending with a customized mask treatment while enjoying a hot stone hand and arm massage. This combination of modalities concludes with a blast of pure blue oxygen infused with bio-Swiss serums to tone your complexion. This Super Facial provides an amazing result. A specific extraction session treating acne break outs, includes the LED Blue light treatment for acne. Clinical Corrective Peels - These peels are Non-Ablative. Non-Ablative resurfacing is less invasive and requires no recovery time. Clinical Peels - These peels will reverse the signs of aging and improve skin conditions such as acne, pigmentation imperfections, and fine lines. Recommended in a series of 3 - 6 Peels 2 weeks apart 30 min each . Derma-planing - This is a technique where the outer layers of skin are exfoliated with the use of a blade. Derma-planing is an effective way to resurface the skin. Oxygen Blast- You will experience a Pure Blue Oxygen Treatment infusing an amazing dermal complex consisting of Vitamins - Peptides - Amino Acids - and Antioxidants . This amazing complex will leave your skin nourished and hydrated. Chemical Peels - A chemical peel is a treatment technique used to improve and smooth the texture of the skin, including facial skin, using a chemical solution that causes the dead skin to slough off, regenerating your skin with a more even color texture and tone. LED Light Therapy - This service can be done in a session by itself or in a Combination session with any Facial Service. LED Light therapy service includes Steaming, a Lactic acid application and extractions. Purchase a series for a package discount.